Got a gaijin card? Got a hanko? 1. Get your full name written in kanji. This is just for paperwork. What is on your hanko really doesn't matter. Note that you don't need to match the sounds or meanings when doing this. If time is not an issue then feel free to play around and find something you like, as it will be your "official" name in Japan. But you can honestly choose to be called Jason Donnovan if you want. My surname is Beverley, which I wrote as the kanji for 'bear' and 'valley', but no-one who registered it knew or cared about that. The hanko can represent either your first or last name. In fact, as my hanko is my first name split into two kanji, the guy at the office asked if I just wanted to use one kanji as my first name and consider the other my surname to save time. NB: Just to be clear, you do not need to get a new hanko if you already have one. 2. Get your employer to stamp a letter confirming that your hanko represents your new full name. 3. Take the letter, your hanko and your gaijin card to the local government office. It shouldn't take longer than about 20 minutes for you to fill out two forms with your name and address, and for them to photocopy everything. You then pay 300yen for registering your hanko and 300yen for the certificate. You will be given a card with the electronic data for your registration so that next time you need one of these certificates you can just present that. 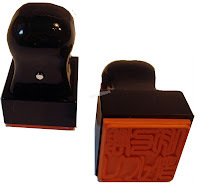 By the way, your registered inkan is called your 実印 (jitsuin). If this gets stolen, it is equivalent to identity theft in the West and you need to report it to the city hall where you registered it to immediately. A 実印 is only used for large property transactions (cars, homes), both buying and selling. You'd need a 実印 when you bought a car under your name as well as when you sold the car to someone else and performed a 名義変更 (meigi henkou, change of registered name) so they were the new official owner of the car. A 実印 is also used when writing up wills and dividing up estates. And, it is needed when you take out a major loan, like for a house. On the other hand, a lot of other legal documents do not require a 実印. Your inkan does not need to be registered with your city in order to create a bank account or sign on an apartment. (As far as I know), the inkan needed to register a marriage or divorce also does not need to be registered.